Beautiful old woodwork on this tram in what would have been the smokers' section. Gosh, this is so good - is it a renovation or has it been totally rebuilt! A very nice image and great pov. Beautiful interior. And what a good idea even back then - keep the smokers separate. Awesome woodwork. It's quite beautiful for chairs! @maggiemae I'm not sure MM, I suspect more like the former, ie using the original slats. @onewing They were much the same on Melbourne trams and I found them quite comfy, but that was in my youth. @merrelyn I spent many hours on seats like this and found them quite OK, but that was in my youth. @olivetreeann I love the glow of that old wood. @jgpittenger Hahaha. Quite right Jane. Great lines and composition. Beautiful woodwork. they sure don't make anything like this anymore. everything is plastic or something. i like the various geometrical shapes and the curve of the seats. aces, marnie! Such a design is beautiful - everything made of wood and steel, wonderfully crafted, with a sense of proportion and a love of detail. And the benches look very comfortable. I also like the grid on the floor. This is culture that works directly and shapes everyday life - actually more important than a picture hanging in a museum. Beautiful shades - I really like these beautiful shades of brown on the wooden benches. They look beautiful on the scenery in the background. Nice to the contrast with dark elements. Wonderfully lit, no dead spot. Also, the vertical dark "bar" on the left edge of the picture in conjunction with the dark door (?) On the far right forms a nice beginning and end. A different kind of tram, but this is the design I knew in my youth for the 'outside' section of the Melbourne trams I used every day. 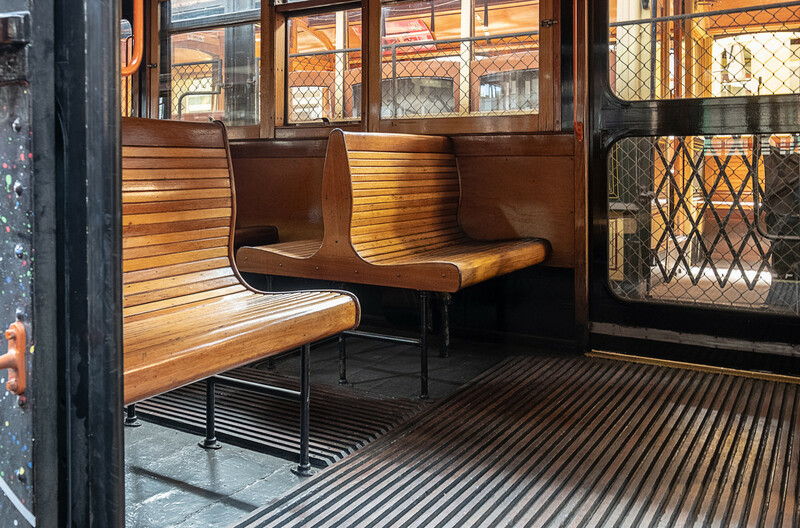 In those unenlightened days, it was usual for women to sit in the sections at either end of the tram, and men/smokers to sit in these seats - hence the type of flooring. I spent many hours of my youth travelling to various places on trams and much preferred this part of the tram with its fresh air. In the 'old days' there were no doors on the 'wrong side' of a tram, just a bar which I used to love to lean over and enjoy the wind and the view.